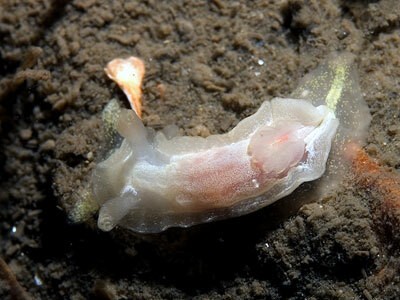 Description: A translucent white nudibranch with small tubercles and specks of white and/or yellow pigment on its dorsum. An opaque pale yellow ridge runs down the middle of the back to the tip of the tail. There is a transparent patch that is situated just behind the branchial plume, this looks like a small pore on the animals back. 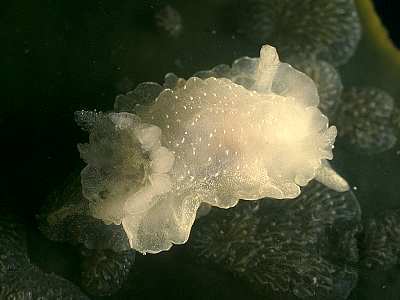 The lamellate rhinophores have a yellow tinge, the oral tentacles are dorso-ventrally flattened. This species may reach a length of 27mm. 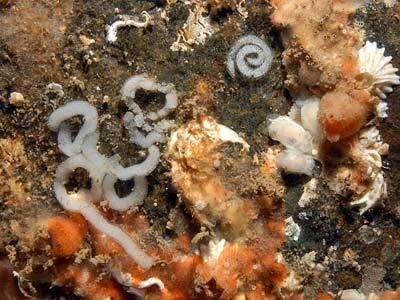 Habitat: Juveniles feed on bryozoans, especially Alcyonidium diaphanum, but the adults feed on ascidians, especially Diplosoma listerianum and Dendrodoa grossularia. Distribution: Distributed from north west Spain to the Faeroes. A common species all round the British Isles both on shore and in the shallow sublittoral, it has been recorded at depths down to 120m. White animal with reduced thin frilly mantle rim and tail extending at rear. Front of head with oral tentacles visible from above. Picton, B.E. & Morrow, C.C. (2016). Goniodoris nodosa (Montagu, 1808). [In] Encyclopedia of Marine Life of Britain and Ireland.